The Binchois Consort presents a disc which demonstrates the beauty and grandeur of the music performed daily in princely chapels of fifteenth-century England. It illustrates the sheer variety of types of singing, some of it virtuosic in its brilliance. Specifically it offers sacred ceremonial pieces written either for Henry V himself, as King, or to invoke the saintly patron of the House of Lancaster, John of Bridlington, as well as a selection of intricate motets. Scholarly notes by Philip Weller place this music firmly in its historical context, and the Binchois performances represent the highest standard of early music singing of the present day. Every nuance is considered and each phrase is relished in this immaculately polished disc. This recording documents in sound something of the cultural seriousness and panache of the royal princes of the House of Lancaster. Above all, it seeks to evoke the vocal and ceremonial beauty of their household chapels. In doing so it celebrates in music the brilliant, iconic figure of Henry V, hero of Agincourt and the French campaigns; the obviously unheroic but still culturally and religiously influential figure of his son, Henry VI; and finally the perhaps unlikely figure they both revered: John Thwenge (Thwing), a fourteenth-century Augustinian prior who, as St John of Bridlington, was to be the last English saint canonized prior to the Reformation. It also celebrates the great Wollaton Antiphonal, a magnificent illuminated chant book of the early fifteenth century that uniquely preserves the melodies of the Bridlington Office and constitutes one of the finest survivals of the myriad liturgical volumes of pre-Reformation England, so very few of which avoided falling prey to the purges and material destruction of the mid-sixteenth century. Our programme presents a spectrum of English polyphonic vocal styles spanning the reigns of Henry V and Henry VI, and we have sought to balance the securely ascribed pieces (by both more and less familiar names) with the anonymous ones. The programme as a whole articulates a kind of journey through Lancastrian dynastic concerns, demonstrating as it does so the sheer variety of types of singing, some of it virtuosic in its brilliance, available to well-staffed princely chapels in England at the time. More concretely, it offers sacred ceremonial pieces written either for Henry V himself, as King, or to invoke the saintly patron of the House of Lancaster, John of Bridlington, as well as a group of motets in honorem beatae Mariae virginis. The Bridlington Mass-setting recorded here dates from the era of his son and heir Henry VI, though it may or may not have been commissioned directly for (or indeed from within) the Chapel Royal itself. It is based on one of the melodies found in the Wollaton Antiphonal (Quem malignus spiritus), and is presented together with items of English plainchant and a selection of motets chosen not just for their sonic qualities, but to illustrate something of the range of styles in use during the ‘Lancastrian decades’ of the fifteenth century. These chants and motets are interspersed among the Mass movements, sometimes as pairs of Latin texts addressed to the blessed virgin Mary, sometimes as integral parts of the order of Mass. The opening sections of the Bridlington Office, up to and including the Responsory which provides the Quem malignus melody, are sung as a kind of musical preface or introduction, beginning at Johannis solemnitas. (As was common in Office chants of the Sanctorale, the various component texts stay very close to the narrative of the life of the saint whose feast was being celebrated, so that anyone listening or participating would be reminded of the relevant stories as the liturgy progressed.) The Asperges me, part of the penitential rite at the beginning of Mass, is then performed to Sarum chant, with the ‘refrain’ being sung to improvised three-voice polyphony (a widespread and characteristic tradition, known in England as ‘faburden’). The conclusion of Mass is marked by a short ‘post missam’ motet for three voices, Agimus tibi gratias, that in time-honoured fashion answers the priest’s dismissal Ite missa est (‘Go, the Mass is ended’). There are three chant/motet pairings dedicated, rather like votive offerings in sound, to the virgin Mary: Gloriosae virginis, Ave regina caelorum and the much-loved Tota pulchra es, which is paired with another Ave regina setting. There is also a group of three extended motets addressed jointly to Mary and St George, as prime intercessors for the kingdom of England (Salvatoris mater, Alma proles and Salve mater). 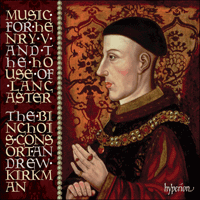 These motets, written by musicians of Henry V’s own chapel, are without doubt political pieces, in a religious and ceremonial sense, reflecting the bellicose history of Henry’s reign with its central victory of Agincourt, and the King’s vital position in relation to the English realm and people at that momentous time. There were celebrations in London following on from the victory itself—an event that was mythologized almost as soon as it had happened, and had already passed into national legend long before Shakespeare and Burbage, let alone Garrick, Kean, Olivier and the rest. Motets played a key role in both the quotidian and the occasional rituals of Henry’s reign, one key event having been the performance of a (now lost) motet Ave rex Anglorum / Flos mundi / Miles Christi—which no doubt expressed sentiments similar to those of the surviving trio of motets—before the gate to London Bridge to herald the King’s entry into the city following his great victory in 1415. The motets may well belong together as a group, which is how they appear in the Old Hall manuscript, couched among the Sanctus and Benedictus settings—and so this is how we present them here, at the appropriate point within the Mass liturgy after the Sanctus (the outer two are based on the two ‘halves’ of a divided Benedictus chant, split at the word ‘ve-nit’). The central motet has the invocation ‘Christ, defend us from our enemies’, and makes a general plea for divine support for both state and people, as well as for the King himself, in time of war. The Missa Quem malignus spiritus is an extended cantus firmus setting based on the chant extracted from the Bridlington Office. It was evidently quite widely known and performed, surviving as it does in as many as four sources (two of which are in fact the same version copied twice). In particular, it survives (in only fragmentary form) in the so-called Lucca Choirbook, a musically substantial manuscript collection of great historical interest that was written circa 1463, in Bruges, probably for use in the chapel of the English Nation of Merchant Adventurers (whose governor William Caxton, a long-time resident of Bruges, had recently become). The chant melody in (relatively) long note values is given in the lower of the two tenor voices, and in our recording has been sung to its original Bridlington text. The high tenor and discantus parts form an integrated pair of voices above this, and are written with a degree of rhythmic interplay and melodic imitation that gives a sense of tautness and momentum to the texture as a whole. This is exceptional, yet not uncharacteristic, for English music at this period. It is becoming clearer, the more the repertory is explored and investigated in greater depth, that there was a really wide range of vocal idiom and compositional style operative in England during this era. And the anonymous status of so many important works, including such pieces as the Bridlington Mass and the iconic Missa Caput, can only serve to sharpen our awareness of this situation, standing as they do beyond what we (often too readily and uncritically) see as the self-consistent personal styles of the best-known composers. The Quem malignus Mass was evidently conceived for a skilled ensemble of singers, whose art seems to have left its mark upon the polyphony—its clearness of line, its sense of rhythmic focus and balance, and the general elegance of its solutions to the problem of presenting the liturgical texts in cogent phrases, while offering at the same time a real sense of articulate musical flow, are all evidence of this. It undoubtedly reflects the professional world of the Lancastrian chapels, and those of the important noble families associated with them (Beauchamp and Beaufort, for example). It is a very individualized piece, and one not easily susceptible to close linkage with others; perhaps the work that offers the closest points of analogy is Frye’s beautiful Nobilis et pulchra Mass, although this relationship ought not to be exaggerated. For the present, the proud anonymity of the Missa Quem malignus spiritus (like that of the Caput Mass, indeed) will remain one of its distinguishing characteristics. Like the Mass, the anonymous three-voice Agimus tibi gratias is also found in the Lucca Choirbook. It is one of a group of (presumably) English motets written together in the manuscript, that are for use at the end of the liturgy (blessing and dismissal); and we may be certain that at some time or other it was heard at Mass in Bruges together with the Missa Quem malignus spiritus, the two being sung from the manuscript they shared. The four-voice motets Gloriosae virginis and Ave regina caelorum are jewels of the art of Leonel Power. These pieces are not long, but their sense of compactness is lightened and dispelled by the exquisite control of line and sonority which they exhibit. Their finely judged and ‘easy’ intricacy lifts them into a time-dimension where a musical moment or phrase may be neither long nor short, but simply of a perfect duration. Moreover their sound is distinctive and individual, as well as beautiful—this is an idiom unlike any other at that period, even in England, and creates a sense of space and luminosity through the masterly interplay of its musical elements. These short antiphon texts are set as a combination of votive offering and gently impassioned invocation, freely alluding to their respective chants as they do so. The Frye Ave regina caelorum was one of the most widely copied and evidently best-loved motets of the entire fifteenth century. It survives in a wide range of sources, was depicted in visual art being sung by angels, and was reworked in keyboard arrangements and with expanded vocal textures. Our version is in four voices, and is transmitted in a source as far away as late fifteenth-century Bohemia. The chant for St John and the succession of the Mass are prefaced by a Gloria, found in the Old Hall manuscript as one of two pieces by ‘Roy Henry’, very probably Henry V himself. That a royal personage should have been a literate musician, no doubt well versed in the arts of singing and musical leisure in addition to those of composition, as well as being very conscious of the personal interest a royal prince ought to take in the musical and ceremonial ordering of his chapel, is on the face of it surprising. Yet as we have seen, the Lancastrians offer, in the vigour of their cultural as well as military prowess, the very archetype of a complete prince in a way that stands as a model for the later Middle Ages, and yields nothing to the princely ideal of later decades. 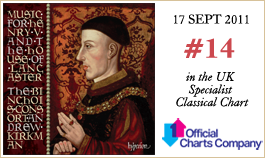 In Henry V’s case, as in that of Charles the Bold later in the century, this engagement with the art of music was clearly a skilled and active involvement. If the English music of the fifteenth century still has the power to speak to us today, with its individuality of sound, its particular beauty and sense of aesthetic priorities, then that is all of a piece with the fame it enjoyed in its own time. For several generations it was valued and performed both at home and abroad, occupying a leading position on the European stage from Italy and France in the west to musical communities far away in Germany and central Europe. It was sung in the most prestigious chapels and ecclesiastical centres, but also in far-flung places which one might hardly expect English music to have penetrated. This was one of those few moments when English music was at the very forefront of European developments, and was openly acknowledged to be so by European masters. No group of aristocratic patrons did more to foster the emergence of such a situation than the princes of the House of Lancaster. Cet enregistrement est un peu un témoignage sonore du sérieux culturel et du panache des princes royaux de la maison de Lancastre et surtout de leurs chapelles privées, dont il entend évoquer la beauté vocale et cérémonielle. Par là même, il célèbre en musique la brillante figure iconique d’Henry V, héros d’Azincourt et des campagnes de France; celle, à l’évidence tout sauf héroïque mais culturellement et religieusement toujours influente, de son fils Henry VI; et celle enfin, improbable peut-être, de John Thwenge (Thwing), un prêtre augustinien du XIVe siècle que tous deux révéraient et qui allait être, sous le nom de Jean de Bridlington, le dernier saint anglais canonisé avant la Réforme. Il célèbre aussi le grand antiphonaire de Wollaton, un spendide cantionnaire enluminé du début du XVe siècle qui préserve remarquablement les mélodies de l’office de Bridlington et constitue l’un des plus beaux ouvrages liturgiques à nous avoir été conservés—l’Angleterre d’avant la Réforme en comptait un très grand nombre, mais rares furent ceux qui échappèrent aux purges et aux destructions des années 1550. Notre programme offre un large éventail des styles vocaux polyphoniques anglais des règnes d’Henry V et Henry VI, et nous nous sommes efforcés d’équilibrer les pièces attribuées avec certitude (à des noms plus ou moins familiers) et les anonymes. Globalement, ce programme nous fait voyager à travers les préoccupations dynastiques des Lancastres, démontrant l’absolue variété des chants dont certains, d’un brio virtuose, pouvaient être entendus dans les chapelles princières anglaises, alors bien loties. Plus concrètement, il réunit des pièces cérémonielles sacrées—écrites pour Henry V en personne, en sa qualité de roi, ou pour invoquer Jean de Bridlington, le saint patron de la maison de Lancastre—et un ensemble de motets in honorem beatae Mariae virginis. La messe de Bridlington enregistrée ici remonte à Henry VI, le fils et héritier d’Henry V, encore qu’elle ait pu être directement commandée pour (voire par) la Chapel Royal. Fondée sur une mélodie de l’antiphonaire de Wollaton (Quem malignus spiritus), elle est présentée en même temps que des plains-chants anglais et qu’une sélection de motets choisis pour leurs qualités sonores mais aussi pour donner une idée des styles en usage pendant des «décennies lancastriennes»du XVe siècle. Ces plains-chants et ces motets sont mêlés aux mouvements de la messe, tantôt sous forme de diptyques de textes latins adressés à la sainte vierge Marie, tantôt intégrés dans l’ordre de la messe. Les sections inaugurales de l’office de Bridlington, qui vont jusqu’au répons fournissant la mélodie Quem malignus, sont chantées comme une sorte de préface ou d’introduction musicale commençant à Johannis solemnitas. (Comme il était alors courant dans les plains-chants de l’office du Sanctorale, les divers textes restent très proches du récit de la vie du saint fêté, si bien que tout auditeur ou participant se voyait rappeler les histoires pertinentes, au fil de la liturgie.) L’Asperges me, qui fait partie du rite pénitentiel marquant le début de la messe, est ensuite exécuté selon le plain-chant de Sarum, avec le«refrain»chanté sur une polyphonie improvisée à trois voix (une tradition aussi répandue que typique, connue en Angleterre sous le nom de «faburden»). La conclusion de la messe est marquée par un court motet «post missam» à trois voix, Agimus tibi gratias, qui, selon une mode consacrée par l’usage, répond au renvoi du prêtre (Ite missa est, «Allez, la messe est terminée»). Trois diptyques plain-chant/motet sont dédiés, un peu comme des offrandes votives sonores, à la vierge Marie: Gloriosae virginis, Ave regina caelorum, et le très prisé Tota pulchra es, apparié à un autre Ave regina. Trois longs motets (Salvatoris mater, Alma proles et Salve mater) sont, en outre, adressés conjointement à la Vierge et à saint George, premiers intercesseurs pour le royaume d’Angleterre. Ces motets, écrits par des musiciens de la chapelle personnelle d’Henry V, sont assurément politiques, au sens religieux et cérémoniel du terme: ils reflètent l’histoire belliciste du règne d’Henry, avec sa victoire fondamentale à Azincourt, ainsi que la position vitale du roi par rapport au royaume et au peuple d’Angleterre, en cette période capitale. Après la victoire, des célébrations eurent lieu à Londres—l’événement, devenu presque aussitôt un mythe, était passé dans la légende nationale avant Shakespeare et Burbage, bien avant les Garrick, Kean et Olivier. Les motets jouèrent un rôle clé dans les rituels quotidiens et de circonstance du règne d’Henry, dont l’un des événements majeurs fut l’exécution du motet (aujourd’hui perdu mais qui, à n’en pas douter, exprimait des sentiments similaires à ceux des trois motets survivants) Ave rex Anglorum / Flos mundi / Miles Christi devant la porte du London Bridge pour annoncer l’entrée du roi dans la ville, après sa grande victoire de 1415. Les présents motets pourraient fort bien faire partie d’un ensemble, car c’est ainsi qu’ils apparaissent dans le manuscrit d’Old Hall, parmi les Sanctus et les Benedictus—c’est donc ainsi que nous les proposons, au moment liturgique ad hoc, après le Sanctus (les deux motets extrêmes reposent sur les deux «moitiés» d’un Benedictus en plain-chant divisé, scindé au mot «ve-nit»). Le motet central arbore l’invocation «Ô Christ, défends-nous contre nos ennemis» et en appelle, d’une manière générale, au soutien divin, en temps de guerre, pour l’État et le peuple comme pour le roi. La Missa Quem malignus spiritus est une messe sur cantus firmus fondée sur le plain-chant tiré de l’office de Bridlington. De toute évidence célèbre et fort jouée, elle nous a été conservée dans pas moins de quatre sources (dont deux sont en fait une copie de la même version), notamment (mais sous forme fragmentaire) dans ce qu’on appelle le Livre de chœur de Lucca, un ensemble de manuscrits musicalement importants, d’un grand intérêt historique, qui fut rédigé à Bruges vers 1463, probablement pour la chapelle de la Nation anglaise des marchands aventuriers (William Caxton, qui avait longtemps résidé à Bruges, venait d’en être nommé gouverneur). La mélodie grégorienne, en valeurs de note (relativement) longues, est exposée à la plus grave des deux voix de ténor—elle est ici chantée selon son texte original de Bridlington. Les parties de ténor aigu et de discantus forment, par-dessus, un couple de voix intégré et sont écrites avec un certain sens du jeu rythmique et de l’imitation mélodique conférant à la texture globale tension et élan. Ce qui est exceptionnel, et malgré tout typique, dans la musique anglaise de cette période. À mesure qu’on explore et qu’on examine mieux le répertoire, il devient de plus en plus évident que l’Angleterre disposait alors d’une très large palette d’idiomes vocaux et de styles compositionnels. Et le fait que maintes œuvres capitales, comme la messe de Bridlington ou la Missa Caput, soient anonymes ne peut qu’aiguiser notre conscience de cette profusion, tant ces pièces dépassent de beaucoup ce que nous tenons (souvent trop volontiers et sans grand esprit critique) pour les styles personnels, cohérents en eux-mêmes, des plus célèbres compositeurs. La messe Quem malignus fut à l’évidence conçue pour un ensemble de chanteurs doués, dont l’art paraît avoir marqué de son empreinte la polyphonie—en attestent la clarté de sa ligne, son intérêt rythmique et son équilibre, ainsi que l’élégance globale avec laquelle elle résout le problème de la présentation des textes liturgiques dans des phrases offrant tout à la fois pertinence et vrai flux musical net. Elle reflète sans aucun doute l’univers professionnel des chapelles des Lancastres et des importantes familles nobles qui leur étaient associées(les Beauchamp et les Beaufort, par exemple). C’est une pièce fort singulière, difficilement rattachable à d’autres, l’œuvre qui présente les analogies les plus proches étant peut-être la superbe messe Nobilis et pulchra de Frye, même si l’on ne doit pas exagérer cette parenté. Pour l’instant, son fier anonymat (comme, au vrai, celui de la messe Caput) demeure donc l’un de ses signes distinctifs. Comme la messe, l’Agimus tibi gratias à trois voix se trouve dans le Livre de chœur de Lucca. Il fait partie des motets (probablement) anglais du manuscrit, utilisés en fin de liturgie (bénédiction et renvoi); et, à une époque, on put très certainement l’entendre à la messe de Bruges, en même temps que la Missa Quem malignus spiritus, chantée à partir du même manuscrit. Les motets à quatre voix Gloriosae virginis et Ave regina caelorum sont des joyaux de l’art de Leonel Power. Ils ne sont pas longs, mais leur compacité est allégée et dissipée par leur exquise maîtrise de la ligne et de la sonorité. Par leur complexité joliment jaugée et «facile», ils atteignent une dimension temporelle dans laquelle les phrases ou les moments musicaux ne sont ni longs, ni courts, mais juste d’une durée parfaite. Qui plus est, leur sonorité est aussi singulière que belle—c’est un idiome unique en son temps, même en Angleterre, un idiome qui, par le biais du jeu magistral de ses éléments musicaux, crée un sentiment d’espace et de luminosité. Ces courts textes d’antiennes sont mis en musique en une combinaison d’offrande votive et d’invocation tendrement fervente, paraphrasant leurs plains-chants respectifs. L’Ave regina caelorum de Frye—l’un des motets les plus prisés et les plus copiés de tout le XVe siècle—nous a été conservé dans un large éventail de sources. Les arts plastiques nous le montrent en train d’être chanté par des anges et il fut retravaillé dans des arrangements pour clavier et avec des textures vocales étoffées. Notre version à quatre voix, elle, provient d’une source remontant à la Bohême de la fin du XVe siècle. Le plain-chant pour saint Jean et la suite de la messe sont précédés d’un Gloria figurant dans le manuscrit d’Old Hall—il s’agit d’une des deux pièces du «Roy Henry» (Henry V, très probablement). Qu’un personnage royal ait été un musicien lettré, certainement versé dans les arts du chant, de la récréation musicale et de la compostion, avec une conscience aiguë de l’intérêt qu’un prince royal devait porter à l’agencement musicalo-cérémoniel de sa chapelle peut paraître surprenant. Pourtant, nous l’avons vu, les Lancastriens représentent, dans la vigueur de leurs prouesses culturelles et militaires, l’archétype même du prince complet, qui se pose en modèle pour le Moyen Âge tardif et ne le cède en rien à l’idéal princier des décennies suivantes. Henry V—comme, plus tard, Charles le Téméraire—s’impliqua dans l’art musical d’une manière active et expérimentée. Avec sa sonorité singulière, sa beauté particulière et son sens des priorités esthétiques, la musique anglaise du XVe siècle continue de trouver en nous un écho, ce qui s’accorde parfaitement avec la renommée dont elle jouit en son temps. Pendant plusieurs générations, elle fut prisée et jouée en Angleterre et ailleurs, occupant le devant de la scène européenne en Italie, en France et jusque dans les communautés musicales très éloignées, en Allemagne et en Europe centrale. Elle fut chantée dans les chapelles et les centres religieux les plus prestigieux, mais aussi dans des lieux reculés, où l’on ne se serait guère attendu à la voir pénétrer. Chose rarissime dans son histoire, la musique anglaise fut alors à la pointe des développements musicaux européens et ouvertement reconnue comme telle par les maîtres européens. Aucun groupe de mécènes aristocratiques ne concourut plus à l’émergence de cet état de fait que les princes de la maison de Lancastre. Die vorliegende Aufnahme ist ein klingendes Dokument der kulturellen Bedeutung und Musikbegeisterung der königlichen Prinzen des Hauses Lancaster. In erster Linie sollen hier die gesangliche und zeremonielle Schönheit dargestellt werden, die in den Kapellen des Hofstaats verwirklicht wurden. Damit wird durch die Musik die brillante und ikonische Persönlichkeit Heinrichs V. gefeiert, der Held von Agincourt und den französischen Feldzügen; die offensichtlich unheldenhafte, aber doch kulturell und religiös einflussreiche Persönlichkeit seines Sohnes, Heinrich VI. ; und schließlich die vielleicht unwahrscheinliche Figur, die sie beide verehrten: John Thwenge (Thwing), ein Augustinerprior des 14. Jahrhunderts, der als letzter Engländer vor der Reformation heiliggesprochen wurde und dann als St John of Bridlington bekannt war. Ebenfalls wird das Antiphonar von Wollaton gefeiert, ein großartiges illuminiertes Gesangbuch des frühen 15. Jahrhunderts, in dem die Melodien der Liturgie zu Bridlington einzigartig festgehalten sind und das eines der beeindruckendsten überlieferten Bücher von den unzähligen liturgischen Bänden des vorreformatorischen Englands ist, von denen jedoch die meisten den Zerstörungen und sogenannten Säuberungsaktionen in der Mitte des 16. Jahrhunderts zum Opfer fielen. In unserem Programm wird ein ganzes Spektrum an englischen polyphonen Gesangsstilen aus der Herrschaft Heinrichs V. und Heinrichs VI. präsentiert und wir haben uns darum bemüht, sicher zugeschriebene Werke (von bekannten und unbekannteren Namen) und anonyme Stücke im Gleichgewicht zu halten. Das Programm als Ganzes stellt eine Art Reise durch die dynastischen Interessen des Hauses Lancaster dar und demonstriert damit die verschiedenen Gesangsstile, die zum Teil virtuos in ihrem Glanz waren, und zeigen, was gut besetzten königlichen Kapellen in England zu jener Zeit zur Verfügung stand. Konkreter ausgedrückt, es erklingen hier geistliche zeremonielle Werke, die entweder für Heinrich V. selbst entstanden, als er König war, oder mit denen der Schutzpatron des Hauses Lancaster, John of Bridlington, angerufen werden sollte, sowie eine Gruppe von Motetten in honorem beatae Mariae virginis. Die hier vorliegende Vertonung der Bridlington-Messe stammt aus der Ära seines Sohns und Erben Heinrich VI., obwohl nicht klar ist, ob sie möglicherweise direkt für die (oder sogar von der) Chapel Royal selbst in Auftrag gegeben wurde. Die Messe basiert auf einer der Melodien aus dem Antiphonar von Wollaton (Quem malignus spiritus) und erscheint zusammen mit mehreren englischen Cantus-planus-Stücken und einer Auswahl von Motetten, die nicht nur aufgrund ihrer klanglichen Qualitäten ausgewählt wurden, sondern auch, um die verschiedenen Stile der „Lancaster-Dekaden“ des 15. Jahrhunderts zu illustrieren. Diese Gesänge und Motetten erklingen zwischen den Messsätzen, manchmal so gruppiert, dass lateinische Textpaare an die Heilige Jungfrau Maria gerichtet sind, und manchmal so, dass sie als integrale Bestandteile der Messordnung erscheinen. Die Anfangsteile der Bridlington-Liturgie bis einschließlich dem Responsorium, in dem die Quem malignus-Melodie erklingt, werden als eine Art musikalische Einleitung gesungen, beginnend bei Johannis solemnitas. (Den Gepflogenheiten in Bezug auf die Offiziumsgesänge des Sanctorale entsprechend, sind die Textkomponenten sehr nah an der Lebensgeschichte des jeweiligen Heiligen, der gefeiert wird, gehalten, so dass die Zuhörer, beziehungsweise Mitwirkenden im Laufe der Liturgie an die wichtigen Gegebenheiten erinnert würden.) Das Asperges me, das dem Bußritus zu Beginn der Messe angehört, wird zu einem aus Salisbury stammenden Cantus planus gesungen, wobei der „Refrain“ zu einem improvisierten dreistimmigen polyphonen Satz erklingt (eine verbreitete und charakteristische Tradition, die in England als „faburden“ bezeichnet wurde). Der Abschluss der Messe wird durch eine kurze „post missam“-Motette für drei Stimmen angezeigt, Agimus tibi gratias, die gemäß altehrwürdiger Tradition die Antwort auf die Entlassung des Priesters, Ite missa est („Gehet hin in Frieden“), ist. Drei Cantus-Motetten-Paare sind, sozusagen als klingende Weihgaben, der Jungfrau Maria gewidmet: Gloriosae virginis, Ave regina caelorum und das besonders beliebte Tota pulchra es, das zusammen mit einer weiteren Ave regina-Vertonung gepaart ist. Außerdem liegt eine Gruppe von drei längeren Motetten vor, die an die Jungfrau und an den Heiligen Georg als primäre Fürsprecher des englischen Königtums gerichtet sind (Salvatoris mater, Alma proles und Salve mater). Diese Motetten, die von Musikern der eigenen Kapelle Heinrichs V. komponiert wurden, sind zweifellos politische Stücke, sowohl im religiösen als auch im zeremoniellen Sinn, und reflektieren die kriegerische Geschichte der Herrschaft Heinrichs mit seinem zentralen Sieg in Agincourt und der wesentlichen Position des Königs in Bezug auf das englische Königreich und Volk zu jener bedeutsamen Zeit. Nach dem Sieg wurde in London gefeiert—dieses Ereignis wurde praktisch sofort, nachdem es sich vollzogen hatte, mythologisiert und ging lange vor Shakespeare und Burbage, um nicht von Garrick, Kean, Olivier und allen anderen zu sprechen, in den nationalen Legendenschatz ein. Motetten spielten während Heinrichs Herrschaft sowohl in alltäglichen als auch bei Ritualen zu besonderen Anlässen eine wichtige Rolle. Eine solche Gelegenheit war die Aufführung der (heute verschollenen) Motette Ave rex Anglorum / Flos mundi / Miles Christi—in der zweifellos ähnliche Empfindungen ausgedrückt wurden wie in den überlieferten drei Motetten—vor dem Tor zur London Bridge, um die Ankunft des Königs in der Stadt nach seinem großen Sieg im Jahre 1415 anzukündigen. Es ist gut möglich, dass die Motetten als Gruppe zusammen gehören, da sie so im Old Hall Manuskript zwischen den Vertonungen des Sanctus und des Benedictus aufgeführt sind. Daher präsentieren wir sie hier ebenfalls in dieser Form an der entsprechenden Stelle innerhalb der Messliturgie nach dem Sanctus (die beiden äußeren fußen auf den beiden „Hälften“ eines geteilten Benedictus-Gesangs, der bei dem Wort „ve-nit“ entzweit ist). In der mittleren Motette erklingt die Anrufung „Oh Christus, beschütze uns vor unseren Feinden“ und bittet um göttliche Unterstützung in Kriegszeiten sowohl für den Staat, das Volk und den König selbst. Die Missa Quem malignus spiritus ist eine ausgedehnte Cantus-firmus-Vertonung, die auf einem Cantus planus aus der Bridlington-Liturgie basiert. Sie war offenbar weithin bekannt und wurde häufig aufgeführt, denn sie ist in immerhin vier überlieferten Quellen verzeichnet (zwei davon erscheinen in derselben Version, die zweimal kopiert wurde). Besonders interessant dabei ist die (zwar nur fragmentarisch überlieferte) Version im sogenannten Chorbuch Lucca, eine musikalisch beachtliche Manuskriptsammlung von großem historischen Interesse, die etwa 1463 in Brügge geschrieben wurde und wahrscheinlich für den Gebrauch in der Kapelle der englischen Nation der kaufmännischen Abenteurer (deren Direktor kurz zuvor der lang in Brügge ansässige William Caxton geworden war). Die Cantus-planus-Melodie in (relativ) langen Notenwerten erscheint in der tieferen der beiden Tenorstimmen und wird auf unserer Aufnahme zu dem ursprünglichen Bridlington-Text gesungen. Der hohe Tenor und der Diskant erklingen darüber als integriertes Stimmpaar und sind in einem gewissen rhythmischen Wechselspiel und mit melodischer Imitation angelegt, was der Gesamttextur Straffheit und Schwung verleiht. Es ist dies außergewöhnlich, jedoch nicht uncharakteristisch für die englische Musik jener Zeit. Bei einer genaueren Auseinandersetzung mit dem Repertoire wird deutlich, dass zu dieser Zeit in England ein sehr vielfältiger gesanglicher Ausdruck und kompositorischer Stil existierte. Und die Anonymität von so vielen wichtigen Werken, wie etwa der Bridlington-Messe oder der ikonischen Missa Caput, sollte das heutige Bewusstsein über diese Situation schärfen, da sie über dem stehen, was wir (oft vorschnell und unkritisch) als den selbstständigen persönlichen Stil der berühmtesten Komponisten betrachten. Die Quem malignus-Messe war offenbar für ein erfahrenes Sängerensemble gedacht, dessen Kunst der Polyphonie ihren Stempel aufgedrückt zu haben scheint. Das zeigt sich in der deutlichen Stimmführung, der rhythmischen Konzentration und Balance und der Eleganz, mit der das Problem, liturgische Texte in überzeugenden Phrasen darzustellen, gelöst wird, während die Musik sich in einem deutlichen Fluss befindet. Zweifellos wird hier die professionelle Welt der Lancaster-Kapellen sowie die der wichtigen, mit ihnen zusammenhängenden Adelsfamilien (so etwa die Beauchamp- oder die Beaufort-Familie) reflektiert. Es ist ein sehr individualisiertes Stück, das sich nicht sofort mit anderen vergleichen lässt; das Werk, das vielleicht noch die meisten Parallelen aufweist, ist Fryes wunderschöne Nobilis et pulchra-Messe, obwohl diese Verbindung nicht überbewertet werden sollte. Erst einmal bleibt die stolze Anonymität der Missa Quem malignus spiritus (wie auch die der Caput-Messe) eines der wesentlichen Charakteristika. Ebenso wie die Messe findet sich auch das anonyme dreistimmige Agimus tibi gratias im Chorbuch Lucca. Es gehört einer Gruppe von (wahrscheinlich) englischen Motetten an, die zusammen in dem Manuskript verzeichnet sind und die für das Ende der Liturgie (Segen und Entlassung) gedacht sind; und man darf davon ausgehen, dass es irgendwann einmal in Brügge in der Messe zusammen mit der Missa Quem malignus spiritus zu hören war, wobei die beiden Stücke aus demselben Manuskript gesungen wurden. Die vierstimmigen Motetten Gloriosae virginis und Ave regina caelorum sind Juwelen der Kunst von Leonel Power. Diese Stücke sind nicht lang, doch wird von ihrer kompakten Anlage durch die exquisite Stimmführung und ihre Klangfülle abgelenkt. Ihre sorgfältig konstruierte, „einfache“ Komplexität befördert sie in eine Zeitdimension, in der ein musikalischer Augenblick oder eine Phrase weder kurz noch lang ist, sondern einfach die perfekte Dauer besitzt. Zudem ist ihr Klang charakteristisch, individuell und schön zugleich—es ist dies eine Klangsprache, die keiner anderen zu dieser Zeit, selbst in England, entspricht und die durch das meisterhafte Zusammenspiel ihrer musikalischen Elemente einen Eindruck von Raum und Leuchtkraft erzeugt. Die kurzen Antiphon-Texte sind als Mischung von Weihgabe und leidenschaftlich anmutender Anrufung vertont und paraphrasieren ihre jeweiligen Cantus-planus-Melodien. Das Ave regina caelorum von Frye war eine der am meisten kopierten und offenbar auch eine der beliebtesten Motetten des gesamten 15. Jahrhunderts. Sie ist in vielen verschiedenen Quellen überliefert, ist in der bildenden Kunst dargestellt worden, wo sie von Engeln gesungen wird und wurde für größere Vokalensembles und für Tasteninstrumente bearbeitet. Unsere Version ist für vier Stimmen angelegt und stammt aus einer weitentfernten böhmischen Quelle des späten 15. Jahrhunderts. Dem Cantus für St John und der Messordnung gehen ein Gloria voran, das in dem Old Hall Manuskript als eines von zwei Stücken von „Roy Henry“, also höchstwahrscheinlich Heinrich V. selbst, verzeichnet ist. Dass eine königliche Persönlichkeit musikalisch gebildet und zweifellos in der Gesangskunst, Komposition und musikalischen Muße bewandert und sich gleichzeitig bewusst darüber war, dass ein königlicher Prinz sich mit der musikalischen und zeremoniellen Ordnung seiner Kapelle auseinandersetzen musste, ist zunächst überraschend. Doch wie bereits deutlich geworden ist, stellten die Lancaster-Prinzen mit ihrer Energie sowohl in kulturellen als auch militärischen Fähigkeiten den Archetyp des vollendeten Prinzen gemäß dem spätmittelalterlichen Vorbild dar und machten keine Zugeständnisse an das fürstliche Ideal der späteren Dekaden. Im Falle Heinrichs V., wie auch Karls des Kühnen, der im selben Jahrhundert, jedoch etwas später lebte, war dieser musikalische Einsatz offensichtlich ein sachkundiges und aktives Engagement. Wenn die englische Musik des 15. Jahrhunderts mit ihrem individuellen Klang, ihrer besonderen Schönheit und ihren speziellen ästhetischen Prioritäten es immer noch vermag, uns heute zu berühren, so ist der Ruhm, der ihr zu ihrer eigenen Zeit zuteilwurde, durchaus angemessen. Mehrere Generationen lang wurde sie sowohl zuhause als auch im Ausland geschätzt und aufgeführt und nahm auf der Bühne Europas von Italien und Frankreich im Westen bis hin zu den musikalischen Gemeinschaften im weitentfernten Deutschland und Mitteleuropa eine führende Position ein. Sie wurde in den repräsentativsten Kapellen und kirchlichen Zentren gesungen, jedoch auch in entlegenen Orten, von denen man kaum erwarten würde, dass die englische Musik sie erreicht hätte. Es war dies einer der wenigen Momente, als die englische Musik sich an der Spitze der europäischen Entwicklung befand und von den europäischen Meistern auch dementsprechend anerkannt wurde. Keine Gruppe aristokratischer Gönner tat mehr zur Förderung dieser Situation als die Prinzen des Hauses Lancaster. This project grew out of a very specific, practical brief: to devise a concert programme for an event that would celebrate in music the process of conserving the Wollaton Antiphonal, and the new phase of intensive study to which this process has given rise. (Parts of the Antiphonal were shown in an exhibition of the Wollaton medieval manuscripts which ran from April to August 2010 at the University of Nottingham; there was a public research colloquium on the significance of the Antiphonal for polyphonic music on 4 May followed by a one-day conference on 8 May, together with the evening concert given by The Binchois Consort.) The research, planning and preparation for the concert opened up new areas of interest and significance and led to the present recording, which brings the Bridlington material and its story into close relation with Henry V, his son Henry VI, and the House of Lancaster. As men and monarchs, Henry V and his heir Henry VI could scarcely have been more different. Despite being father and son, and (in theory at least) schooled to the same role and the same tasks, they were about as dissimilar as could be imagined. Henry V was the great warrior, with tremendous reserves of character and strength of purpose, whose personality and achievement both on and off the battlefield became the stuff of myth even in his own lifetime. The admiration he enjoyed and the loyalty he commanded were of heroic proportions. Henry VI, by contrast, was the would-be conciliator, whose gentler nature and perhaps too-scrupulous indecision and anxiousness made him a weak leader—a king at the furthest possible remove from his father. Yet the two men were alike in their keen promotion of music. This was especially true of Latin sacred music for the ceremonial operations of the chapels they supported: the celebration of Mass and of Vespers, as a sign of their princely dignity and the divine order of their earthly rule. On this level, our concert and recording project has brought them closer together than they ever were in life. For while they were separated in history by the tide of events, and in posterity by our rather fixed view of their divergent personalities and destinies, they resembled one another in their keen appreciation and patronage of polyphonic art music, and of the working musical institutions needed to support it. Between them, the Lancastrian princes—Henry and his brothers Clarence and Bedford, essentially, and later the younger Henry—employed most of the famous composers of the era at one time or another. The sense of high-level collective musical endeavour was crucial to the development of strong musical personalities, the fruits of whose labours expanded the horizons not only of English but of European music. The Lancastrians contributed to this in a huge way. As royal figureheads, they brilliantly displayed an all-round package of strengths, virtues and accomplishments: their aristocratic personae and the organization of their entourage offered a palpable sense of richness and dignity. This was part of the aura of power and kingship; and their sense of display—including the best available sacred music, sung by the best singers—helped to maintain that aura. The functional needs of princely ceremonial, and the technical and aesthetic needs of maintaining a brilliant musical establishment and its associated repertoire, went hand in hand. Henry V may have been the quintessential soldier and leader of men; but he also embodied to a remarkable degree the arts of peacetime and good governance, too, as the early fifteenth century understood them. He was in this sense an important agent of cultural as well as political and military history. In him we can easily observe how the nature of the man and the performance of his role, with its many associated tasks and duties, together contributed to the strong projection of his kingly identity. His son Henry VI was by contrast no great leader, a peaceable man whose reputation has understandably suffered by the comparison with that of his father. But the younger Henry was among other things a religious patron of great energy and commitment, the results of whose activity (as distinct from his historical reputation) have in some instances outlived and outshone those of his father—as for example in his great collegiate foundations at Eton and Cambridge. And the fact that many such colleges were from the very beginning set up as places where polyphonic music was to be cultivated, and the relevant singing and composing skills carefully nurtured, relates directly to the flourishing state of English music throughout the fifteenth century, to the vigour of its traditions, and to its international fame. Partly, the emphasis on English saints was a matter of cultural identity; but it was a question of politics as well. National and regional relationships were being renegotiated during the fourteenth and fifteenth centuries, even as the Hundred Years War and the Wars of the Roses were being played out (over decades, rather than years). The exigencies of place and power formed part of this process of renegotiation; and so far as the expression of loyalty and nationhood was concerned, authority and solidarity resided as much in securely located, culturally grounded religious tradition as in force of arms or jurisdiction. This is one strong reason, no doubt, why the cult of John of Bridlington became an important factor for Henry IV and his descendants. He was a regional saint, whose shrine was within easy striking distance of their ancestral stronghold at Bolingbroke in Lincolnshire, and may well have been thought of as offering a kind of resistance, or better: a kind of positive rivalry, to the rising cult of Archbishop Scrope at York. This was doubly important because Henry IV had had Scrope executed for treason after the confrontation at Shipton Moor—and the last thing he wanted was a renewal of the York-based rebellion in the form of a popular uprising fuelled by religious feeling, and focused on a local ‘martyr’ to the Yorkist cause. Such a sense of urgency to match the strength of political and military power with the strength of ceremonial and cultural display was accentuated for the Lancastrians not least because they were usurpers. The energy with which they pursued this was genuinely heroic; and there is little doubt that their sense of the need to invoke divine aid, or at least seek divine approval, was part of their way of dealing positively with the dynamics of their situation. The Lancastrian revolution (there is no other appropriate word) of 1399 brought them to power, but there was resistance on every side. The psychological need to find, and feel, support from on high was probably overwhelming. And there is no doubt whatever that Henry V did in fact take his religious obligations, especially those towards the saints, very seriously indeed; a devoutness stemming at least in part from the moral exhortations of Thomas Hoccleve, whose Regement of Princes had been written for him and presented to him prior to his accession, in 1411, when he was still Prince of Wales. As in all things, however, he fulfilled his duties not just pro forma but decisively, with heroic energy. As indicated above, the conservation project has been allied with new historical and interpretive research on the Antiphonal. This research is in turn framed within a larger project devoted to the collection of medieval manuscripts of Wollaton Hall Library, where the Antiphonal resided from the mid-sixteenth century until Christmas 1924. It belongs, as it did in the later fifteenth century, to the parish church of St Leonard’s; but it was as a result of having been kept in the family library at Wollaton Hall that the Antiphonal miraculously escaped the purges and destruction of the Henrician Reformation. The Antiphonal is a sumptuous illuminated medieval service book produced in the early fifteenth century (most probably in East Anglia) for Sir Thomas Chaworth (1380– 1459), an enormously wealthy magnate and bibliophile, and one of the most prominent noblemen in the East Midlands. Influential and very active in public life, in addition to being rich and well connected, he was related to the Plantagenet-Lancasters through a common ancestor, the first Sir Patrick de Cadurcis (the original form of Chaworth), and seems to have commissioned the genealogical additions to the famous Chaworth Roll, that brought his very distinguished family tree up to date, in the early years of the fifteenth century. This strong connection to the House of Lancaster (as a young man he had fought at Agincourt with Henry V, with a force of eight men-at-arms and twenty-four archers) probably explains why he might have had a personal—and also dynastic—investment in his devotion to John of Bridlington. He would have sought to maintain and express that devotion as a mark of his Lancastrian loyalty, as other great families such as the Beauchamps and Beauforts would also have done. Moreover, he seems to have had a special allegiance to the Augustinians: he was buried with his wife in an Augustinian house, Launde Abbey in Leicestershire, where he had previously founded a chantry. So there is every likelihood that the Bridlington Office may have been copied (as a special addition) into the Antiphonal at his instigation, some time between the book’s completion circa 1430 and his death in 1459. He may have viewed his prized liturgical manuscripts (in part at least) as luxury cultural objects. Certainly, their visual and artistic aspects were important to him. But there seems little doubt that he valued them for their religious significance as well, perhaps even primarily; and this then fits in very well with what we know of the acts and attitudes of conventional piety that characterized his later years. His combination of immense wealth with a genuine religious sensibility was a fairly common one among the medieval nobility, and quite naturally found expression in bequests to religious communities and institutions, and in the purchase of extravagantly expensive devotional and liturgical books. If the stylishly adorned Book of Hours was the usual acquisition (the ‘must have’ accessory of choice for fashionable devotion), the purchase of formal liturgical books may not in itself have been all that rare, though the sheer size and splendour of Chaworth’s Antiphonal must surely have been exceptional. Besides the Bridlington Office itself, entered on separate leaves of vellum at the end of the Sanctorale, there are other additions to the book that are specific to the Use of York, or to the Willoughby family and to Wollaton in Nottinghamshire, which date from the later phase of the book’s existence once it had passed into the possession of the parish church of St Leonard’s, soon after Sir Thomas’s death in 1459. It probably came to the church through the good offices of Richard Willoughby (d1471) of Wollaton Hall (the old hall, which stood close by the church), who was Chaworth’s chief executor; and it was paid for out of the estate of the rector of Wollaton, William Husse, who died in 1460. The close physical study of the manuscript has opened up a new phase of interpretive and contextual study, which is proving to be of real fascination and historical interest. Handwritten changes are present in the Calendar, including the addition of York feasts and the listing of Willoughby obits and commemorations, and also the feast of dedication of Wollaton church. Other handwritten entries, and the glorious heraldic illuminations, tell their own story vividly; and it is the matching of these visual elements with our knowledge of the book’s history that speaks eloquently to us of the practical, everyday use to which it was put, despite its extreme richness as a visual object. The written image of music has a fascination all its own. Not just the striking visual character and precision of the notational symbols, and also (in the best cases) the clarity and elegance of the script, but the whole conception and layout of the musical book have the power to fix our attention. And this is true whether the book is a liturgical volume, a collection of polyphony, or indeed, in later music, a composer’s autograph. The Wollaton Antiphonal demonstrates very well the extraordinary beauty of the finest kind of liturgical book production of the early fifteenth century in England. (It came, almost certainly, from a skilled East Anglian scriptorium and illuminator’s workshop around 1430.) The arresting mise en page for the beginning of Psalm 109 (fol. 246v) displays the technical virtuosity as well as the visual brilliance of the illuminators. Its decorative scheme shows the Trinity, and also illustrates some of the armorial designs which proclaimed the status and pedigree of Sir Thomas Chaworth, the original owner of the Antiphonal, and his wife Isabella. The image of the singing clerics also illustrates the first verse of a Psalm text (Psalm 97, fol. 241v). The page showing the beginning of the Office of the Assumption (fol. 369r) comes, like the Psalm leaves, from the main body of the volume, while the two leaves showing sections of the Bridlington chant (fols. 411r-v) are an addition: they come at the very end of the Antiphonal, appended to the section devoted to the feasts of the Saints. As indicated elsewhere, the community of the parish church of St Leonard’s, Wollaton were owners of the manuscript from 1460 and again from Christmas 1924 when it was once more returned to their possession. Were it not for the fact of their custodianship of the Antiphonal, and of its having been kept safe in the interim in the Hall library from the ravages of the Reformation, we would never have had the music of the Bridlington Office at all, and our scenario would have been much less complete. Thanks are due to the church for their generosity in wishing to share what is in their possession, and for participating in the telling of an extraordinary story. Thanks are due as well to all those who have worked, both in the church and later in the Nottingham University Library, to look after and maintain this precious book, and finally, not least, to the man who—with no little courage—took the first great plunge towards the immense task of conserving the Antiphonal in its entirety: Nicholas Hadgraft (1955–2004). The realization of this project owes much to many people: to all those involved in the AHRC Project at the University of Nottingham (especially Thorlac Turville-Petre and Dorothy Johnston) we owe the initial impetus and framework for the concert, as well as the magnificent exhibition Saints, Sinners and Storytellers in which parts of the Antiphonal were shown; to Catherine Hocking, who developed the project with a rare understanding both for the practicalities and for the larger musical and intellectual picture; to the rector and churchwardens and all the community of St Leonard’s, Wollaton, who supported the project enthusiastically (and hosted a memorable Saturday event in the church, at which some of the chant was sung by all participants, just prior to Easter 2010); to the Plainsong and Medieval Music Society who supported and publicized the venture; and to all those who by presenting papers at the conference (jointly hosted by the University of Nottingham and the Plainsong and Medieval Music Society) on the day of the concert, or by answering questions, or by simply entering into a process of discussion and debate, enlarged everyone’s sense of the range and reach of the project, offering new information or new perspectives as they did so: Juliet Barker, Nicolas Bell, Roger Bowers, John Harper, Richard Pfaff, Matthew Cheung Salisbury, and other questioners and respondents among the large audience at the conference. Thanks also to Margaret Bent, whose early engagement with the Missa Quem malignus spiritus first opened up this particular corner of the vast ‘anonymous field’ of fifteenth-century English music. Thanks in addition to Father Graeme Rowlands (St Silas the Martyr, Kentish Town).